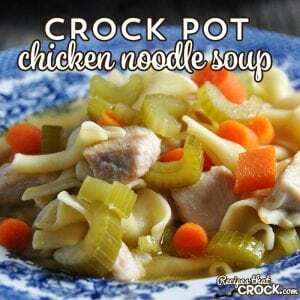 Crock Pot Chicken Noodle Soup - Recipes That Crock! Winter, summer, spring or fall, no matter the season, there is one food that comes to mind when you want the ultimate comfort food. You know you all are thinking the same thing! Chicken Noodle Soup! 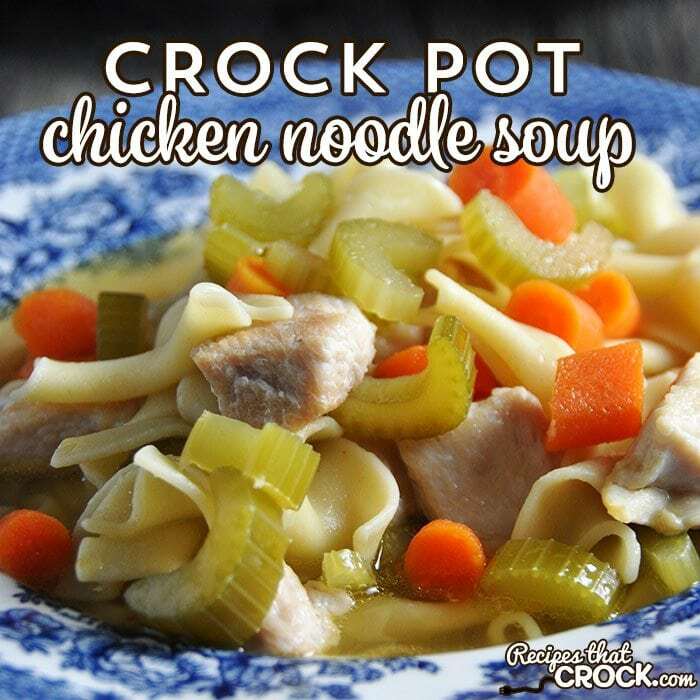 So why not let your crock pot do the work for you with this Crock Pot Chicken Noodle Soup recipe?! As you may know, I haven’t always been able to cook. I have made cookies that would not bake and been intimidated by making a box of Hamburger Helper. So there was no way I was going to make up my own chicken noodles soup. I always had a rule back in the day, no one…and I mean no one…was to eat the last can of chicken noodle soup unless they were sick. That way I knew that if someone was feeling under the weather, there was at least some chicken noodle soup to comfort them. These days though, I know how easy it is make up my own Crock Pot Chicken Noodle Soup for when someone in my family feels ill or when I am having a crowd over! I was looking through Cooking Light’s Slow Cooker Tonight! and saw a good recipe, but I got to tweaking and changing things up, so I didn’t end up following that recipe, but I do LOVE that cookbook. So I highly recommend checking it out! You can cut this recipe in half or double it up for what the needs of your family are. Just make sure you adjust the size of your crock pot and cooking time accordingly. This is the perfect recipe to tailor to the likes and dislikes in your house. I sliced up a full 16 oz carrots because my kiddos love carrots. You can add as much or as little celery, carrots and chicken as you like! If you want to be more economical, you can buy regular carrots to peel and slice. If you need a more time friendly option than slicing baby carrots, buy a bag of shredded carrots! I used good ol’ Sir Hamilton (my Hamilton Beach Programmable Insulated Slow Cooker) because, let’s be honest. I play favorites with my crock pots, and Sir Hamilton is all-star favorite. Tried, true and trustworthy! When I finally wear him out, I will probably cry. Don’t judge! 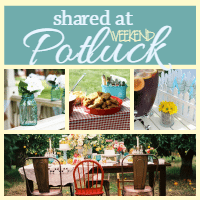 😉 You can use your favorite 6-quart crock pot. The ultimate comfort food in your crock pot! i would like to try the beef pepper soup on my own,what is the procedure? I believe this is the recipe you are looking for: http://www.recipesthatcrock.com/slow-cooker-stuffed-pepper-soup/. Enjoy! Nutritional information will always vary depending on the exact products you use to make the recipe. For example, this recipe calls for broth. There are low sodium broths available. It is always best to trust the labels on your products over any calculation you find with a recipe which will be a guess at best unless they tell you specifically which products they used and you use the exact same products. Hope that helps. 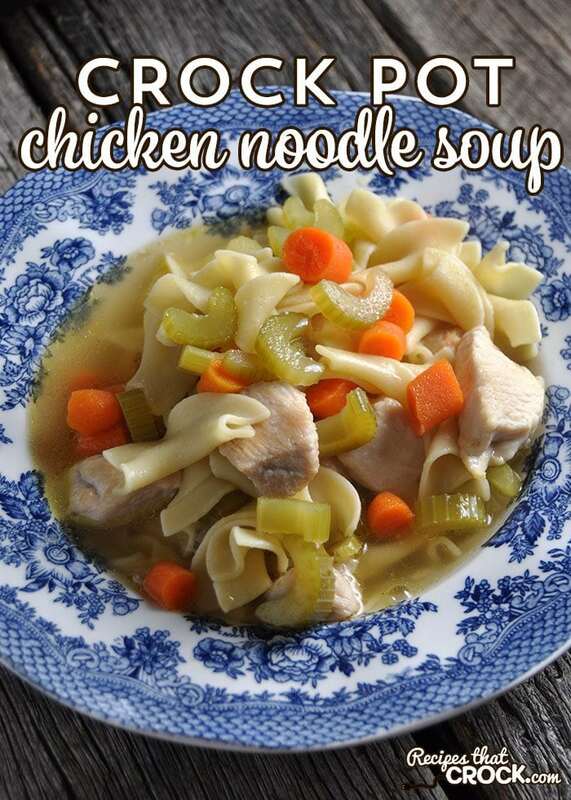 Nutrition data – for the chicken noodle soup? My husband is on a low sodium diet.